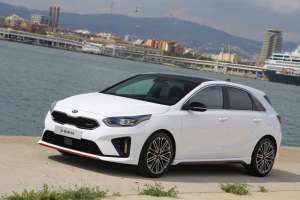 The new Kia Ceed GT will be priced from £25,535 and will thankfully be available only with a six-speed manual transmission. The 1.6-litre turbocharged petrol engine produces 201bhp and 265Nm of torque, available from 1,500rpm to 4,500rpm. 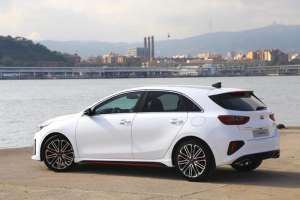 The result is a 0-60mph time of 7.2 seconds and a 143mph top speed, while CO2 emissions are rated at 155 g/km and WLTP economy of 38.2 mpg. 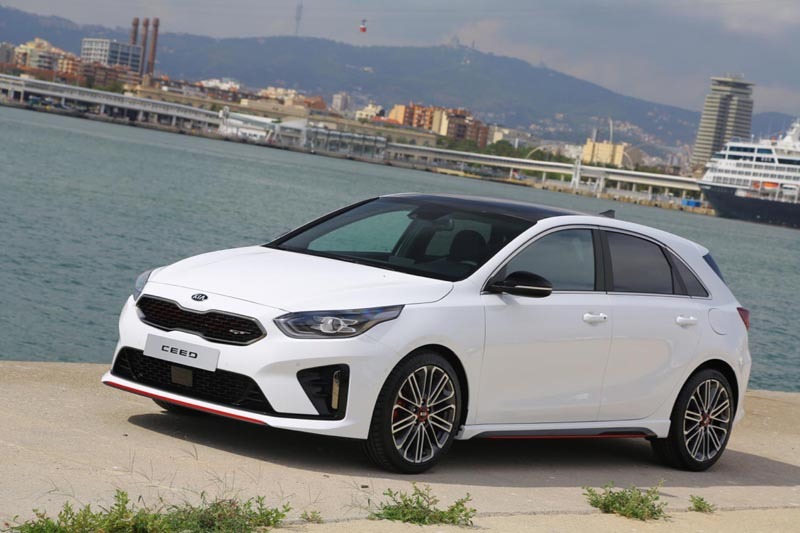 Kia’s chassis supremo, Albert Biermann, has been responsible for the Ceed GT’s development. Engineered exclusively for European roads, the GT has undergone an additional six months of testing. 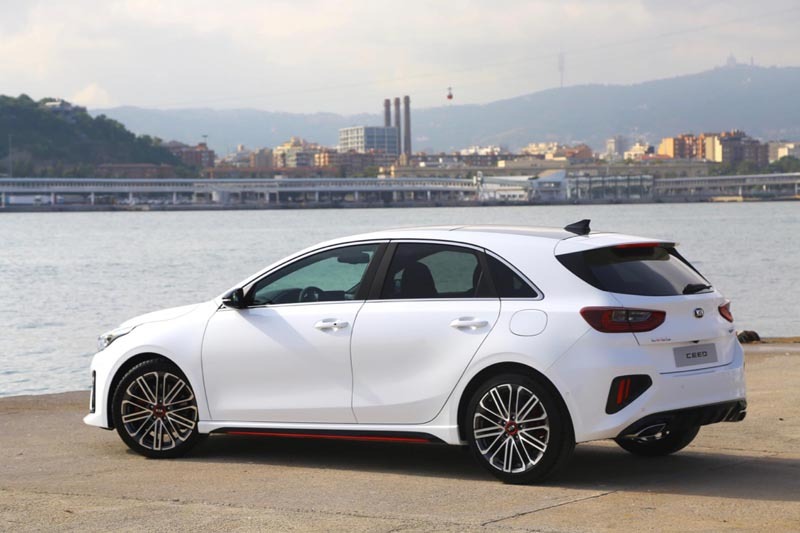 Compared to regular Ceed models, the GT sits 5mm lower on stiffer springs, while optimised anti-roll bars work to keep the tyres in contact with the road surface during hard cornering. The company’s Vehicle Stability Management and Torque Vectoring by Braking systems have also been recalibrated, while larger 320mm front brake discs, a faster 12.7:1 steering ratio (now 2.44 turns lock-to-lock) and Michelin Pilot Sport 4 tyres all contribute to the GT’s unique set-up. From the outside, the GT is recognisable thanks to a unique front bumper design with larger air intakes, dark chrome grille surround, gloss black trim with red highlights for the side sills, and larger 18-inch alloy wheels. Inside, the GT features a black headliner, D-shaped steering wheel with GT logo, aluminium pedals, sports seats in black leather and faux suede with red stitching and embroidered GT logo. Standard specification includes 8-inch touch-screen infotainment system with TomTom navigation, Android Auto and Apple CarPlay, keyless entry, heated front seats, smart park assist, and a fleet of safety gadgets. For drivers who appreciate the design but perhaps don’t need the same level of performance, the new GT-Line models are also available. The wheels are slightly smaller at 17-inches but many of the styling cues remain. Engine choices are a 118bhp 1.0-litre three-cylinder turbo petrol, a 138bhp 1.4, and a 134bhp 1.6-litre CRDi diesel.